From left: Sultan of Sokoto and President General, Nigeria Supreme Council for Islamic Affairs (NSCIA), Alhaji Muhammad Sa'ad Abubakar, President of the Muslim Ummah of South West Nigeria (MUSWEN) and Deputy President General (South), NSCIA, Alhaji Sakariyau Olayiwola Babalola, Representative of President Muhammadu and Minister of Education, Mallam Adamu Adamu, Emir of Kano, Alhaji Muhammad Sanusi II and the Timi of Ede, Oba Oba Alhaji Munirudeen Adesola Lawal, during the MUSWEN, event at the International Conference Centre, University of Ibadan, Ibadan, Oyo State capital on Sunday November 18, 2018. Sunday November 18, 2018 is not too far a past but it is worth a thing to again bring to fore as subject of discourse, in the sense that it was a day that it finally dawned on all and sundry that the Muslims of South West Nigeria had finally found a voice of their own. 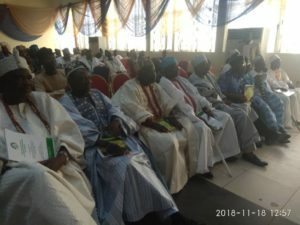 From left: Chairman, Ekiti State Muslim Traditional Rulers and Attah of Aiyede Ekiti, Oba Alhaji AbdulMumini Adebayo Orisagbemi, and other traditional rulers at the MUSWEN even on Sunday. The religious peace that is found in the region, though has been generally acknowledged even by people who supposedly never had tolerance for others in matter of religion, is a feat that came by the Islamic faithful’s endurance and tolerance, considering the many atrocious religious intolerance launched against them and their female members in public institutions including schools, hospitals and other places without a united body fighting their course or speaking out on their behalf except the Muslim Rights Concern (MURIC), which is a Non-Governmental Organisation trying its best in advocacy. 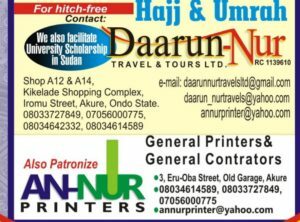 With the Muslim Ummah of South West Nigeria (MUSWEN) coming alive ten years ago, the era of voicelessness began gradually to dim yet the Ummah still suffered hitches as not much it was able to do in addressing many of the challenges facing its members in the region until in less than 365 days to its 10th anniversary of establishment, having to stand in the face to the National Christian Elders’ Forum (NCEF) parading themselves as some Retired Christian Generals and others including Afenifere, Ohanaeze and Middle-Belt leaders doing no less than ensuring that banners of Islam are lowered particularly in the region, such as the unnecessary IRK/CRK controversy, Leah Sharibu-based religious war threat by both Christian Association of Nigeria (CAN) and NCEF, aggressive attitudes of their members against anything Islam or Muslim in public institutions and so on, MUSWEN under the leadership of its President, Alhaji Sakariyau Olayiwola Babalola, OON, started to tell the anti-Islamic elements that “Enough is Enough”! 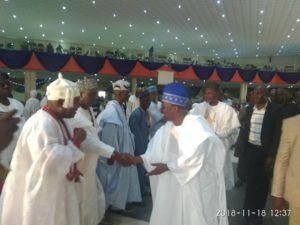 Governor of Oyo State, Senator Abiola Ajimobi, on arrival, greets the Aragbiji of Iragbiji, Osun State, Oba Alhaji Abdulrasheed Olabomi, while other traditional rulers watch with keen interest, during the event. Since that time the Muslims in South West have enjoyed relative peace within themselves sure that, no matter how daring any religion-based aggression towards them is, they now have a body which speaks out for them and follows it up with means possible within the law of the land. 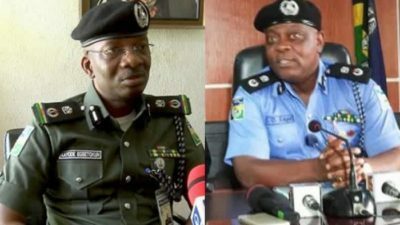 Per adventure these are what President Muhammadu Buhari saw that led to his Sunday November 18 pronouncement in Ibadan, Oyo State capital, through which he commended Muslims in the geo-political zone of the country for promoting peaceful coexistence of Nigerians from different religious backgrounds in the region. 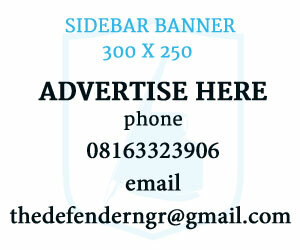 In the same vein, the Sultan of Sokoto and President General of the Nigerian Supreme Council for Islamic Affairs (NSCIA), whose Deputy President General incidentally is the President the MUSWEN, acknowledged the enduring tolerance of Muslims in the region but asked them continue to be calm and remain faithful to Allah as, according to him, problem is never solved by violence. Governor Abiola Ajimobi greeting Sultan of Sokoto, Alhaji Muhammad Sa’ad Abubakar, while President of MUSWEN, Alhaji Sakariyau Babalola, right, Minister of Education, Mallam Adamu Adamu, JAMB Registrar, Professor Is-haq Oloyede, others look with keen interest, during the MUSWEN 10th Anniversary at International Conference Centre, University of Ibadan, on Sunday November 18, 2018. Oyo State Governor Abiola Ajimobi, who was hailed ‘Sheeehu!’ as he arrived and spoke at the event, also lent his own voice saying Muslims of Yoruba Land should continue to embrace peace especially as 2019 general elections are fast approaching. 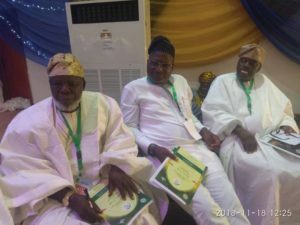 From Left: Former Commissioner for Finance, Old Ondo State, Dr. Afolabi Ogunlayi, and others, during the event. Speaking in his speech at the grand finale of the 10th anniversary celebration of the Muslim Ummah of South West Nigeria (MUSWEN) and N5 billion launch of MUSWEN International Islamic Centre, which took place at the International Conference Centre of the University of Ibadan, President Buhari commended the faithful for their tolerance. 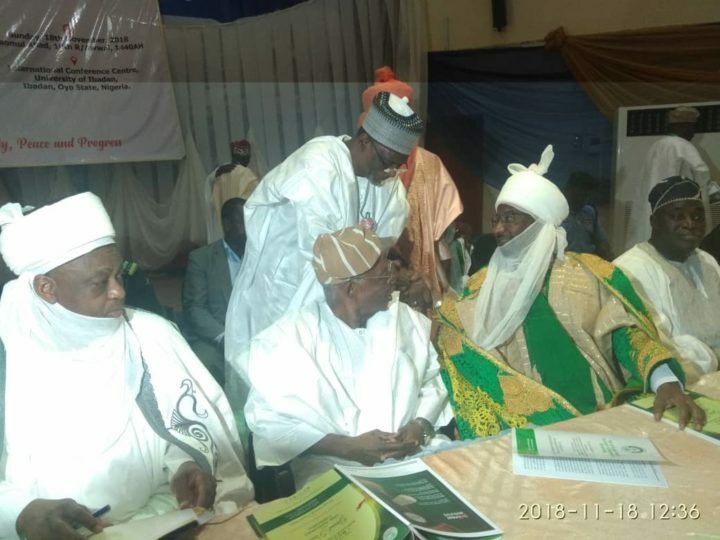 The President, who was the Chief Guest of Honour at the event and represented by the Minister of Education, Mallam Adamu Adamu, assured of the readiness of his administration to continue to promote religious tolerance in the country. 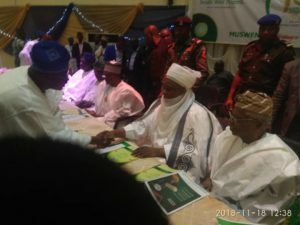 He lauded MUSWEN for giving “a voice to Muslims in South West Nigeria”, noting that the region has continued to contribute immensely to the development of Islam in the country. Sultan Sa’ad Abubakar, in his speech, cautioned Muslims against violence, urging them to remain calm, even at the point of provocation. According to Sultan, whenever the Muslims are denied their rights, they should not use foul and abusive languages, noting that this was hallmark of Prophet Muhammad as a messenger of peace. He said, “Let’s show decorum, let’s show people that we are Muslims. We should not use foul languages. We can be aggrieved, but don’t let us allow grievances to make us to be violent”. Similarly, in his keynote address, the Emir of Kano, Alhaji Muhammad Sanusi II, insisted that Islam is a religion of peace, adding that national security should not be threatened or undermined all in the name of Jihad. Some Muslim women at the event. 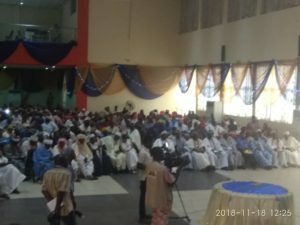 A former President of the organisation and currently Chairman, Board of Trustees, Prince Abdul-Jabar Bola Ajibola (SAN), who stressed the need for unity among Muslims in South West with credible leadership, noted that in the last 10 years, MUSWEN had made conscious efforts to have robust engagement with its internal and external stakeholders. Represented, Ajibola said MUSWEN had taken genuine steps that have set the Ummah in the region on the path of development and progress. 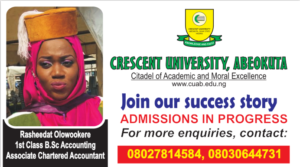 He added that the body had recorded some modest achievements especially in the areas of education, scholarship scheme for female medical students, empowerment scheme through zakat, free medical and professional development opportunities among others. 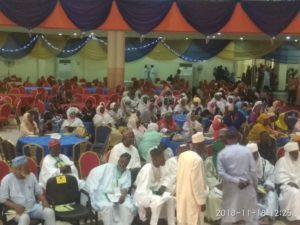 Another interesting thing that happened at the occasion was the declaration of Muslim Ummah of South West Nigeria (MUSWEN) as a major component of the Nigerian Supreme Council for Islamic Affairs (NSCIA). 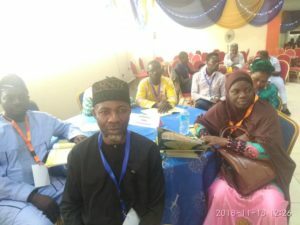 “We are grateful to Allah that over the course of the past 10 years, MUSWEN has grown and gained acceptability within and outside the Muslim Community, both in the South West region and across the country. 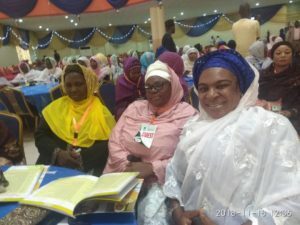 From Left: Alhaji Kabir Alabi Garba, Deputy Editor, The Guardian Newspaper and Chairman Muslim Media Practitioner of Nigeria, Lagos State Chapter, Warees Solanke,Assistant Director, Strategic Planning and Corporate Development at Voice of Nigeria (VON), and Alhaja Sakinah Lawal, Online Editor, The Point Newspaper and Chairperson, National Women Journalists (NAWOJ), Lagos State Chapter, during the MUSWEN event on Sunday. 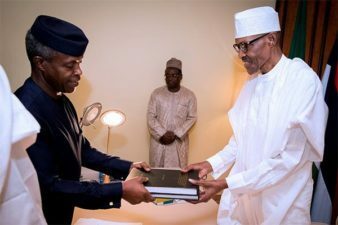 What that declaration by Babalola seeks to engender is to make MUSWEN leadership the automatic determinant of who occupies the office of the Deputy President General of NSCIA just like leadership of Sultanate determines who occupies the office of the President General of the Islamic Council. 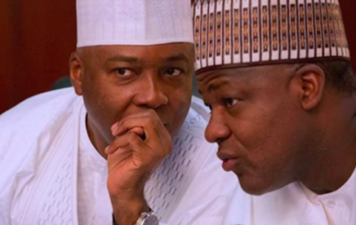 If this is truly the idea, it then means, not only that the Yoruba race that is mainly the South West region of Nigeria has come finally to concluded unity but also, that MUSWEN itself now will have more to do as it has to continue to ensure that Muslims with consciousness of Islam and are of proven integrity, like it has been ever since inception, emerge as its leader. It will then begin to rise to responsibility of ensuring that no single Muslim, baby, toddler, young or adult will ever again suffer any religion-based deprivation in any institution especially headed by non-Muslims and will also have to work on the politics and economy of the Ummah in the region in its entirety.